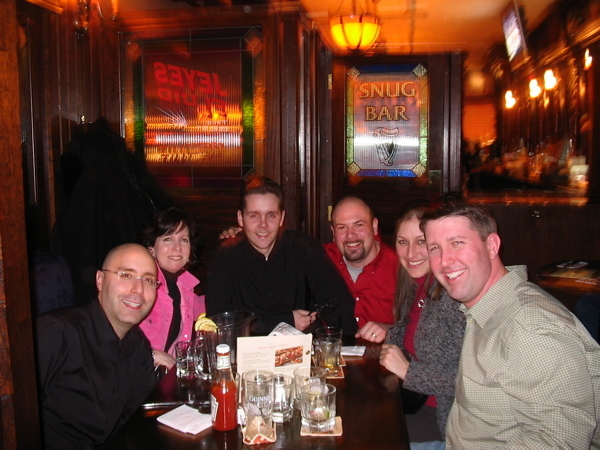 My first (real) social media meet-up and unconference was an outstanding success. Pounding the pavement in the Hockey Hall of Fame was a nice addition as well. 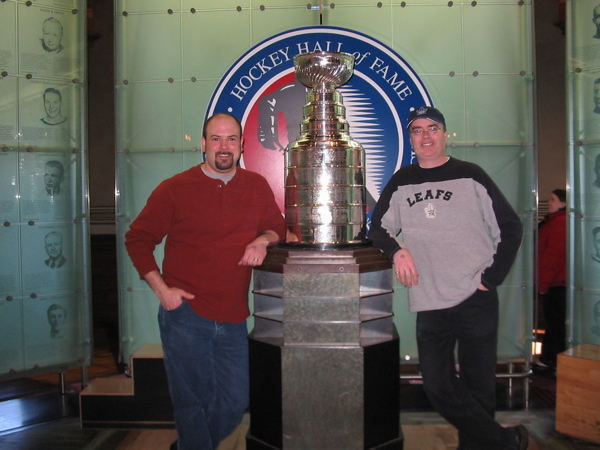 Pictured is me and my good friend The Stanley Cup along with Terry Fallis of Inside PR and The Best Laid Plans book podcast. Terry was a perfect gentleman and chauffeur all weekend. If you need driven around town by the president of a very successful international public relations agency, I suggest him. Tell him Luke sent you. I, for one, am going to have to revisit every session taught by Christopher Penn of the Financial Aid Podcast/Student Loan Network one tidbit at a time if I’m going to retain anything he said. Here’s a fanatical tech guy who actually understands the technology, grasps the communication aspects of the tools AND can talk intelligently about it. A rare breed of genius, that guy. He provided great hacks on increasing the podcast audience and marketing, for instance. Mitch and John Wall dropped some creative ways to SEO and Google juice your podcast in my last Saturday session. The geek dinner with Mitch, Donna, Bryan Person of the excellent New Comm Road podcast, the lovely Carin, and John Wall, with a rock star cast at the table behind, fed my mind and body. Donna, in exceptional geek fashion, set up her rig and recorded for posterity. Should be on a future Trafcom News Podcast if it turned out. The night rolled right into a rocking good time at C’est What? with Uncle Seth. I’m a converted fan. Chris Clarke finally woke up long enough to steal $20 from me and keep me up way too late. 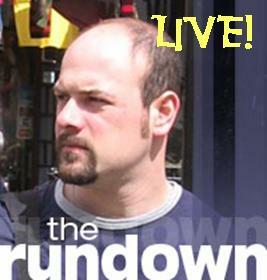 Our Sunday morning panel (photo) (video) was recorded and the audio was inserted in Mitch’s podcast this week. Great minds surrounded me as we tackled the question, “Should your company be podcasting?” Awesome insights from Donna, Terry, and the ever articulate Michael Seaton, who, by the way, is the only person I personally know getting paid to produce a podcast (okay, sure he does a myriad of other stuff, but still). He detailed some great info in his session (link to his video) on how to get buy-in from a huge multinational organization. Without reviewing the videos, the most concrete things I walked away having are some outstanding new tools like StumbleUpon, Twitter, Mobatalk (met Michael Bailey by chance in the elevator Friday night, I love this stuff), and MyBlogLog. Too much to mention, but I hope to be using some of it soon. Check out the tagged photos on Flickr and Chris’s blog post. Thanks to John for posting this snap. Bob and Donna both have good recaps of events as do many others. I’m still crying myself to sleep about missing David Jones, but I hope to someday get over it. Why, David, WHY have you forsaken me? Thanks to all those who took the time to share insights and chat about their knowledge. Shout out to Brogan and Casey & Rudy from Galacticast (a hilarious geek-focused comedy videocast) hope to see you all again soon. Apologies to the dozens of great folks I never had a chance to meet. Special thanks to Leesa and Brent Morris of The Closet Geek Show, Jay Moonah of Uncle Seth and Online Music Marketing, and Julien of the In Over Your Head hip hop podcast, and Mitch for all their hard work. I love an impromptu Geek Dinner! It was such a pleasure hanging out with you Luke. Thanks for your insights and passion! Thanks for all your enthusiasm. It was certainly great to meet you Luke – I wish that we had a few more days to compare notes and share some ideas. Perhaps you can drop me an email when your new baby arrives. Many thanks for the kind words. Slides are also up on the wiki, and yes, I talk too fast. Tea instead of coffee for me next time! Terry and I are the same person. We’re never seen in the same room. By the way, it looks like you and Terry are posing for the Sears Catalogue…hope the rest of your date was nice. That’s all I wanted was some acknowledgment, some hint that you cared that I traveled all the way to Toronto to meet you – only to be denied. [cue sad music] And maybe you don’t care, and maybe you are indifferent to me, and everyone knows that the opposite of love isn’t hate, it’s indifference. Oh, what a wicked, wicked world. [switch from minor to major key tonality] But I’ll see you someday, meet face to face, as you know, it’s a small world, after all. By the way, Terry and I were posing for a catalogue, the Catalogue of Cool. We had a very nice time, thanks for asking. But it wasn’t the same without you. I mean, just on the surface, no one made any fart jokes. Hope you enjoyed the Redbull, Coffee, and sugar at the Magic Kingdom. Thanks for dropping by to leave comments. I’ll be keeping my eyes and ears open for new work from you. Still trying to catch up on the past week’s videos. Michael, I’ll be sure to post something big when the little bundle arrives. Shouldn’t be long now.